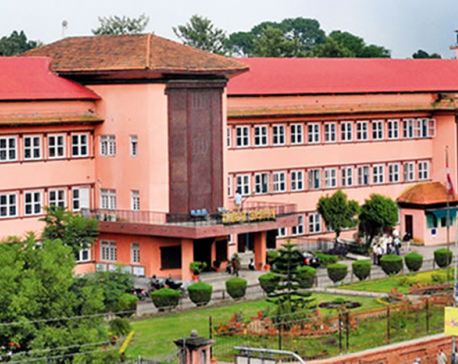 KATHMANDU, Aug 18: The Supreme Court on Wednesday issued a stay order on the incumbent government's decision to withdraw the recommendation of 14 individuals for ambassadors in various countries. 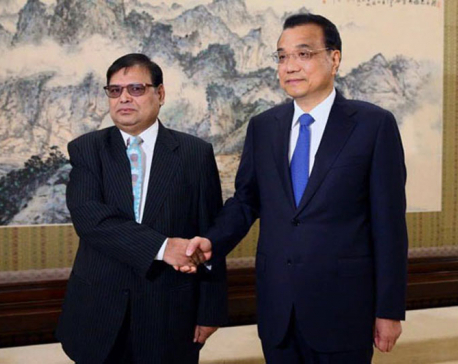 KATHMANDU, Aug 17: Deputy Prime Minister and Minister for Finance, Krishna Bahadur Mahara and Chinese Prime Minister Li Keqiang held a meeting at latter's office at Zhongnanhai in Beijing on Wednesday morning. 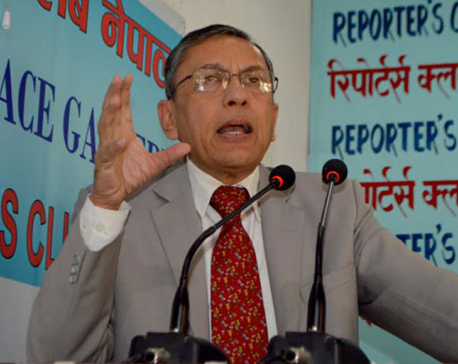 KATHMANDU, Aug 17: Indian Ambassador to Nepal, Ranjit Rae on Wednesday said that high-level visits between Nepal and India will be held soon. KATHMANDU, Aug 17: A voting under the Nepal Students Union's 11th General Convention has started, five hours late of the scheduled time. 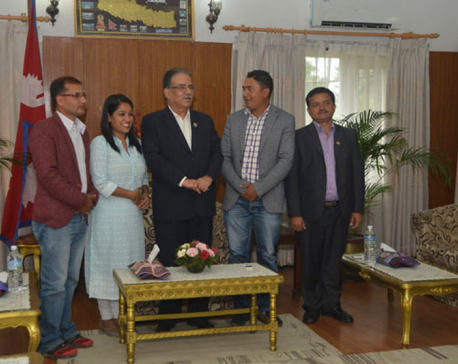 KATHMANDU, Aug 17: Prime minister, Pushpa Kamal Dahal, has declared to donate his first salary to Dhurmus-Suntali Foundation. The PM took this decision in a meeting with the artist couple at his Official Residence in Baluwatar, on Wednesday morning. 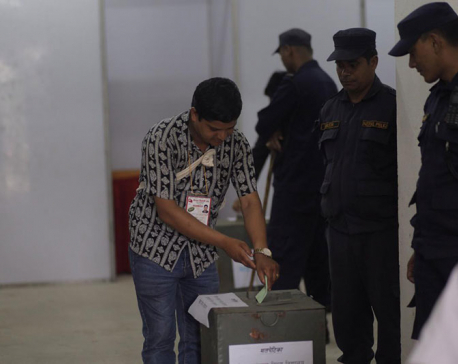 KATHMANDU, Aug 17: A voting under the 11th General Convention of the Nepal Students Union has been delayed. KATHMANDU, Aug 17: Despite increase in investment by Nepal Army's Welfare Fund in various sectors, the profit declined in the fiscal year 2072/073 due various factors including fluctuation in bank interest rates, the devastating earthquake of April 2015 and Indian blockade. KATHMANDU, Aug 17: The Department of Immigration on Tuesday stated that it issued 163,518 visas in the FY 2015/016. Majority of those were tourist visas, a few were business visas and others were non-tourist visas. 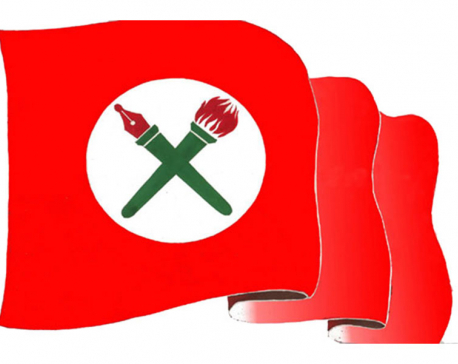 KATHMANDU, Aug 17: Ten days after the inauguration of the general convention and a gap of nine years, Nepali Congress' student wing -- Nepal Student Union (NSU) -- is set to hold election to choose a new leadership on Wednesday. KATHMANDU, Aug 17: Prime Minister Pushpa Kamal Dahal has started discussions with the Ministry of Finance (MoF) to increase the house reconstruction grant to be provided to the earthquake victims to Rs 300,000 from Rs 200,000 each.